Growing air links between this country and Mexico aren’t alarming Aeromexico, one of the several carriers carrying people between Canada and the Latin American country. Aeromexico joins Air Canada and Interjet in delivering Canadians to Mexico City, and there are also several airlines linking points in Canada with other destinations in Mexico. 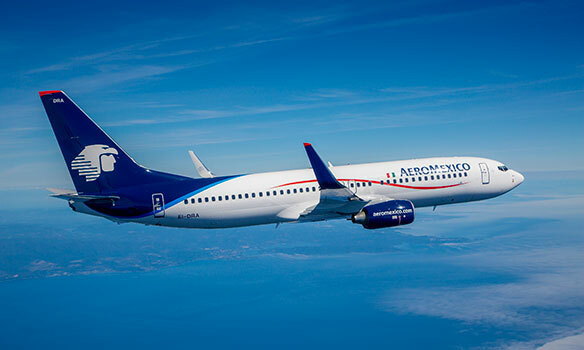 But Paul Verhagen, Aeromexico’s senior vice-president of international sales, says that carrier is seeing a “healthy demand” for its routes from Montreal, Toronto and Vancouver to the Mexican capital. Double-daily service is offered by Aeromexico from each Canadian city. Verhagen conceded that Aeromexico doesn’t have as high a profile in this country as Air Canada, but noted it is “working more closely with WestJet” and that Calgary-based airline, in turn, has a strong relationship with SkyTeam member Delta Airlines. Aeromexico has what Verhagen described as a “healthy mix” of passengers from this country, with leisure travellers, corporate clients and the VFR market all helping to fill its planes. He added that the airline also carries Latin Americans from countries other than Mexico who are living in this country, but worry that if they return home for visits they may have trouble getting visas to go through the United States. The airline has around 16 destinations in Central and South America. Verhagen added that Aeromexico serves over 45 points throughout Mexico, including what he labelled a “very strong Cancun product.” Aeromexico has some 15 to 20 Mexico City-Cancun flights a day, with the carrier serving as “basically an airbridge” between those destinations. Verhagen also said that Aeromexico is “by far the most punctual airline in Mexico, with 83% of its flights leaving and arriving within 15 minutes of schedule. As well, “65% of flights arrive and depart on the minute,” which Verhagen said is a “very strong” performance by his airline. He said Aeromexico has strong on-board Mexican influences, with prominent Mexican chef Enrique Olvera inspiring its on-board menus. As well, tequila is available for passengers. Meanwhile, Verhagen said it’s possible that more Canadian cities will be added to Aeromexico’s network, with the airline always looking for new opportunities.